Frost tender, erect perennial with short, rhizomatous roots, spirally arranged, lance-shaped leaves, and dense racemes, to 20cm long, of deep violet flowers, to 2cm across, in autumn. To 2.5m. [RHSE, Hortus]. ‘It has a kind of tuberous fleshy root, whence the stems, which are of a succulent consistence, rise to the height of two or three feet, and produce their elegant flowers in the autumn: they continue long in succession.’ [LBC no.1196, 1827]. 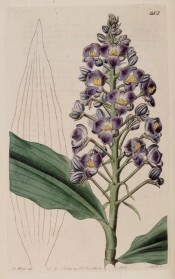 ‘This plant is handsome, and highly worthy of cultivation,-first, on account of its being easy to cultivate; secondly, for its free disposition to flower; and lastly, on account of the immense number of blossoms produced on a single raceme, which not infrequently exceeds six inches in length, and these of so rich a blue as to render it in a flowering state very desirable as an autumnal ornament for a stove. […] It was raised from seed some years ago received from the Brazils, where, Mr. Milkan informs us, the species is found wild at about thirty miles’ distance from Rio Janeiro.’ [MB p.127/1836]. ‘D. thyrsiflora is the handsomest plant of this order, and one of the best stove plants in cultivation, for winter or late autumnal flowering. We have seen it, under liberal treatment, rise to ten feet, branched all round, and every branch ending in a long spike or thyrse of densely-set, sky-blue flowers.’ [JD]. Introduced to Britain in 1822. [JD]. BR f.682/1823. Listed only in the 1857 catalogue [T.383/1857]. Unlikely to have survived the frosts of Camden in the open ground but may have been grown in the Stove.